Little Gate’s Ruby Elephant class has added a small world play center in their classroom and one of many choices in this center is to reenact the story of The Three Little Pigs. While collecting props for this story, the teachers realized that they did not have anything to use as the pigs. Next stop, McGehee’s Maker Lab for collaboration with the 8th grade STEAM students on the 3D printer. After reading several versions of the story, each Ruby elephant picked out a design for their pig and visited with the 8th grade for a design consultation with a buddy. 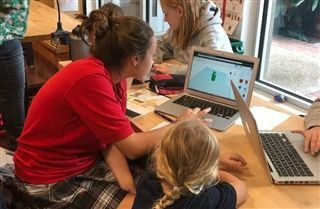 The goal for the 8th grade student was to design an object on TinkerCAD based on the Ruby Elephant student’s vision. The 8th graders filled out a client design form after speaking with the Little Gater and began working on the design for the pig. They will meet again in November so the Rubies can watch their design come to life on the 3D printer.